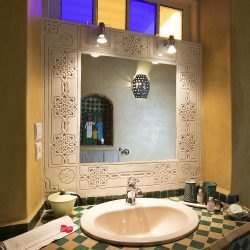 In this suite, feel the restorative powers of the argan forest. The emerald tones of its artisan furnishings will bring to your stay a touch of serenity. 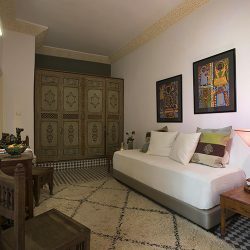 Visit the Argan fields in the countryside around Essaouira, visit the cooperatives that process the Argan nuts and you will realize why this room gives you such well-being. Argan oil, whether cosmetic or culinary, are exclusive to Morocco and this long kept secret of Morocco has been globally discovered and desired, with good reason. Indeed, it can soften the skin but it is also used to hydrate hair. Argan oil is also a culinary oil, eat alone as often Moroccans do or creatively combine in sweet or salty dishes. 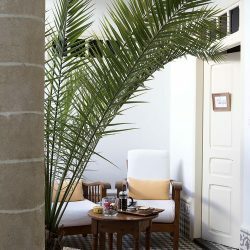 The roots of the Argan trees can also be crafted by artisans to transform into beautiful furniture and remarkable ceilings such as those of Riad Emotion. The emerald tones of the furniture we used to decorate this room, warm and bright will also contribute to the serenity of your stay. Emerald tones of furniture that we used to decorate this suite, warm and bright, will also contribute to the serenity of your stay. From there to say that a particular power emerges from this plant, gift of nature … there is not only one.